"I look away for one second and then he's nowhere to be found!" Dimitri grumbled frustratingly. Dimitri was certainly not pleased knowing that Flicker was by himself when he said they would stick together, but Wingen was on the verge of panicking at the news. Considering that he was already flustered when he managed to meet up with Dimitri, that was saying something. Wingen's mind was all scrambled by the anxiety over what The Engineer told Granite what to do to the Buzzes, which made articulating those words to Dimitri all the more difficult for him. Once he managed to relay the message, Wingen added, "We need to hurry and find them! There's no telling what Granite could do!" "We just fought a thirty-foot tall winged Ixi! Where else could that have come from?!" Wingen sputtered, having no patience whatsoever. "Relax. All I'm saying is that I don't believe that The Engineer or anyone like her is quite as powerful as the stories say. There's just too much missing information about her that I'm skeptical about," Dimitri replied defensively, putting his hands up. "Regardless, Granite is a nasty piece of work and he could hurt the others in plenty ways that don't involve magic. Like you said, we need to hurry!" They didn't get terribly far before Dimitri sensed that something wasn't right as they got closer to the denser areas of the city. He said that it wasn't as bustling as it usually was, which was odd since he never heard any alarms calling the mechanics to the Core Stabilizer. Dimitri spotted someone that he knew running down the streets and asked him what was going on. The Lutari had brown fur and wore clothing that Wingen recognized from books detailing the culture of a desert civilization on the surface. He answered that a bunch of Neopets from another cave started causing Fireflies on the other side of the city trouble and then declared that they had something to show all of Central Cavern. Wingen and Dimitri glanced at each other nervously. That couldn't be good. They followed the Lutari and eventually they saw a large crowd in the distance. The crowd was circled around three metal poles with Flicker, Lumin, and Lampyri chained to them. Flicker found the crowd that stared at the three Buzzes mostly unfamiliar. All of the civilian Fireflies were there, as the foremen managed to find them and herd them to the scene. But there were a large amount of surface-dwellers there as well, confused over what was happening. Perhaps their presence was the point. It was redundant for Granite to strike fear into Neopets that were already afraid of him. The foremen guarded the front of the crowd, preventing anyone but Granite from reaching the three restrained Buzzes. Their hands were tied behind their backs with chains that were in turn attached to metal poles. All three of the poles were stuck to a large cement block, which meant that Flicker couldn't muscle his way out of that situation. Yet, Flicker still felt that he should have at least made an attempt to break himself, Lumin, and Lampyri free. After all, he was the one that charged straight into the trap. Flicker hung his head guiltily; not only did he get himself in trouble exactly as everyone on his side feared, but now he dragged other people into it. "Flicker," he heard Lumin say to him. Flicker's eyes were the only thing that moved, he couldn't bear to lift his head at all. "Don't beat yourself up over this." That was easy for him to say. He wasn't the one to realize that he should have listened when he was told he was being too rash and hasty. Flicker heard movement coming from his left. Lampyri's eyelids cracked open as she began to stir. The instant she felt the chains on his wrists, she was snapped into alertness. She first looked at her own ironic situation and then over to Flicker and Lumin to see that they were in the same one. The guilty feeling that Flicker was growing familiar with came over Lampyri's face as well as she squeezed her eyes shut. "I'm so sorry..."
Lumin shook his head. "You did what you could." Flicker could see Lumin's reasoning that there was no point in trying to assign blame now. That didn't mean that he agreed with him, as Flicker's shoulders were still feeling heavy with regret. Granite then stepped forward towards the Buzzes, silencing the crowd. He gazed at their helplessness for a moment before grinning. "And you insisted on trying to fight back. Well, that worked out quite well for you, didn't it?" Granite addressed Flicker, prompting a few foremen behind him to start laughing. Granite held his hand to the foremen to quiet them. He approached Flicker until he was practically in his face. "See where this ended you up? Because of your idiocy, you and those other two Fireflies aren't going to be Buzzes for much longer." Granite showed Flicker's hand to him, revealing the Set mark with four uses still available. "And guess what? I have the power to do that in place of The Engineer." Flicker continued to glare at Granite, but he could feel his heart begin to pound. The beating in his chest was clear for him to hear, as the air around him became much quieter. The surface-dwellers murmured in confusion, but aside from that there was silence. None of the other Fireflies -whether it was Lumin, Lampyri, or the civilians watching from a distance- said anything. "The Engineer will reward me rather handsomely for this, but I still can't help feeling hunting you down was a waste of time," Granite snarled. "In the end, you weren't worth that debt I forgave just to get you." Lumin suddenly sat up straight. "What do you mean by that?" Granite was surprised to hear Lumin dare to speak to him, considering the position he was in. "One of my miners had Flicker work for me so he could get forgiveness over a debt. Flicker might have useful for a few years, but now I realize I just ended up with a piece of trash." Flicker saw Lumin's eyes widen and his face begin to crunch into a scowl as he finally understood what happened. When he responded to Granite, Lumin's tone of voice was much harsher than Flicker had ever heard it before. "You used him like a tool?!" Granite growled scornfully, "And what does it matter to you?" "He is my son!" Lumin hissed. Suddenly, the smugness from Granite's face disappeared. "By the way," Lampyri spoke up, containing just as much disdain in her voice as Lumin's did. "Flicker just so happens to be the prince of our kingdom." That was when Flicker saw something he had never seen before: an expression on Granite's face that indicated that he had made a serious mistake. Although, that was not likely because of any real guilt over the way he treated Flicker. Rather, Granite's breath began to tremble once he realized just how big of a target the leadership of the City of Lights had on him now. Regardless of the reason, it was such a strange sight for Flicker to see someone who was always confident in his power become so nervous. Granite spun around to the crowd with keenness to end the whole thing. "Listen up! You arrogant Fireflies and you worthless surface-dwellers! This is what will happen if any of you cross me!" As Granite shouted to the crowd, Lumin whispered to Flicker with his voice still entrenched in anger, "Flicker, listen to me. Let Granite proceed with what he's about to do." Flicker was certain he heard him wrong. "What?!" But he didn't; Lumin was resolute in that decision and his hard grimace at Granite suggested that he was not going to change his mind. Flicker turned to Lampyri in desperation, but she too supported Lumin's judgment. "Do what your father says, Flicker." What's going on? Flicker thought, confused and horrified with what was coming out of their mouths. Wasn't this what they were trying to prevent? Didn't they tell him how terrible it felt to be transformed? But Flicker could hardly resist anyways as Granite walked up to him. Flicker clamped his eyes shut and braced himself as Granite put his left hand on his chest. "No... No! We're not going to make it!" Wingen frantically yelled as he and Dimitri rushed towards the crowd. It was an awful, gut-wrenching feeling for Wingen; they were close enough to see Granite make threats to Flicker and the others while he readied himself to carry them out, but too far away to do anything about it. Wingen swiveled his head around, desperately looking for someone or something to help them out. He caught the sight of Dimitri's arm cannon and yelled, "Dimitri! Your cannon! Shoot a fireball at Granite! Hurry!" "If I do that from this distance, I'll end up hurting everyone else!" Dimitri replied anxiously. Wingen tugged on his hat in response; he should have known that, but he could hardly think straight in so much tension. There was nothing he could do. It was completely hopeless. Wingen was completely hopeless. He was supposed to look after Flicker and he failed. How could he have let that happen? But then Wingen lifted the rim of his hat out of his eyes and forced himself to look at Flicker and Granite. He couldn't explain it, but there was a twinge of doubt in his mind that told him that something wasn't right about the situation. Flicker didn't know how long he had been closing his eyes, but eventually he came to the realization that it had been a quite a while. Seconds slowly began piling up as Flicker kept waiting for the burst of pain that he had been told about, only for it to never come. Flicker opened his eyes and looked at himself. He was still a glowing Buzz. He didn't look any different. He didn't feel any different either. His eyes then shifted to Granite. The Meerca was also confused, probably even more so than Flicker. Granite took his hand off of Flicker and then looked at his palm, presumably finding that nothing had changed about the mark on it. Growling in bewilderment, Granite put his hand on Flicker again. This time, Flicker didn't close his eyes. He just watched as absolutely nothing happened to him. "What's going on?!" Granite breathed. Granite distanced himself from Flicker, ran over to Lampyri, and placed his hand on her head. Nothing. Then he went over to Lumin and did the same to him. Still nothing. Granite backed up and shook his head fretfully. He saw Lumin giving him an unforgiving stare, prompting him to yell at the white Buzz, "What are you doing to me?!" "I'm not doing anything," Lumin said in a calm fury. "You're making a fool out of yourself." Granite turned around to find that was absolutely true. He heard the crowd mumbling in skepticism as they watched him. 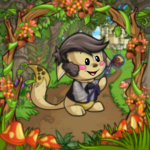 "I knew it; he's a fraud," Granite heard one Neopet say, followed by echoed sentiments from the rest of the surface-dwellers. When Granite swiveled his head to his foremen, he saw that even they had doubtful looks on their faces. Suddenly, Flicker heard a rumbling noise rapidly approaching. It wasn't the same sort of sound that the Dal made; instead it sounded like hundreds of footsteps storming the area. Flicker soon found out that was exactly what it was. The area became packed with an enormous group of Neopets and Flicker realized that they were all miners from Obsidian Quarry. And by the way they were staring down Granite and the foremen, Flicker guessed that they were not happy. The surface-dwellers and the Fireflies knew well enough to move aside as the Obsidian Quarry group entered the scene. And once they did, the massive mob let out a roar that rang in the cave even louder than the ones that Gabbro made. Once they began to rush forward, the foremen didn't stand a chance; they were completely overpowered by the sheer quantity of Neopets. When Granite saw how his foremen were practically being swept aside, he decided that he wasn't going to stick around and let the same happen to him. With one last scowl at Flicker, Granite turned around and fled from the mob. A few of the Obsidian Quarry citizens ran over to the Buzzes and began untying the chains. A fire Ruki worked on Lumin's, to whom the white Buzz said in a gratefully tone, "Thank you so much for coming!" "No, thank you for telling us that Granite was here!" the Ruki replied as he pulled the chains off of Lumin's wrists. Flicker looked at the miner that was helping him out and wrinkled his eyebrows once he saw him. "You look kinda familiar..." Flicker commented to the skunk Scorchio as he tried to remember why that would be. The Scorchio didn't answer Flicker; instead, he looked away from him with an enormous amount of regret in his face. One of the foremen, a brown Blumaroo, stumbled out of the brawl. He noticed that the Buzzes were being released and decided to make one last-ditch effort to stop that. But before he could launch any kind of attack, Lampyri grabbed the chains that a shadow Lupe had taken off of her and whipped the Blumaroo back with them. But that swift action caused Lampyri's injuries to bring her down to her knees. Once Flicker had been freed and was able to stand up, he ran over to Lampyri to help her. However, Lampyri held her hand up as she tried to get back on her feet by herself. "I'm fine... I've been in worse shape than this!" She managed to get standing again, but it didn't last long as she soon lost her balance and began to fall back down. This time, Flicker caught her before she could hit the ground. "Flicker! Flicker!" a familiar voice rang out in the chaos. Flicker gave a big grin when he saw Wingen running towards him, and he could tell the Wocky was just as relieved. "I was so worried! Is everyone okay?" In defiance of her physical state, Lampyri was the first one to nod in response to Wingen's question. "It's a good thing that those miners showed up when they did. But Granite managed to get away..." she said as her voice shook in pain. Dimitri wasn't far behind Wingen, so he heard what Lampyri said and replied to it, "I saw Granite leave the cave! I don't know for certain, but I think he's heading back to Obsidian Quarry!" "He left in a Marlock-pulled carriage that he stole from the miners. There's no way we'd be able to catch him on foot!" Wingen continued. They then heard someone whistling to them. The skunk Scorchio waved his hand to further grab their attention as he yelled, "We have plenty more carriages! You can use one of them to chase after Granite!" Once Lumin went over to Lampyri to support her along with Flicker, all five Neopets followed the Scorchio to a carriage with an extremely large Marlock attached to it. Most Marlocks were rather small Petpets, but Obsidian Quarry used a giant breed of them to assist with labor and transportation. A grey Kacheek was sitting at the top of the carriage, beckoning the group to hurry and get inside. They did without a word and the carriage immediately rolled out of Central Cavern in pursuit of Granite. The bumpiness of the ride wasn't helping Lampyri much as she tried to rest her injuries off. "Perhaps it would have been better if you stayed behind," Lumin said. But Lampyri insisted that she was alright and refused to hear anyone tell her otherwise. "So that's why you left! You went to bring all those miners to Central Cavern! That was pretty amazing!" Flicker exclaimed to Lumin as he thought harder about what had happened earlier. Lumin shook his head with a smile, though. "Flicker, all I did was tell them that Granite was in Central Cavern. Believe it or not, you had more to do with their actions than I." When Lumin saw Flicker grow confused, he elaborated, "They saw you stand up to Granite when he threatened Wingen before the two of you left Obsidian Quarry. They were inspired by that and decided that they could rebel against Granite as well. People like Granite often forget that the power they find themselves so obsessed with comes from the people under them. If they do not have the support of the people they should be leading, then they really don't have any power at all." Flicker was stunned to hear that. He never thought that hasty action he made in Obsidian Quarry would have so much influence. But before Flicker could contemplate much more about that, he heard Lumin say sadly, "Flicker, why didn't you tell me how Granite treated you?" Flicker shrunk back a little in shame. "I... I thought you would be upset if I told you." Lumin sighed, "No parent wants to hear about their children being hurt. But they also don't want to be kept in the dark about those sorts of things. Flicker, don't ever feel like you can't tell me something. Alright?" Flicker nodded, partially relieved, but not entirely. While Flicker knew that he didn't have to keep secrets from Lumin anymore, there was still the matter of telling Wingen about the side-effect of his rapid aging. He assumed that what Lumin said about wanting to stay informed applied to anyone that cared about him. But Flicker still couldn't muster up the bravery to follow through on that. Dimitri was also in the dark about several details on Flicker, the least of which was his history with Granite. "The situation between you and Granite was worse than I thought, wasn't it?" he guessed. "I'm sorry... I should have done something sooner..."
The whole subject was one that nobody seemed too thrilled to talk about. Wingen decided to change the subject; not so much out of a desire to move away from it but rather from an urge to pacify a nagging question. "I'm not complaining, but how come Granite couldn't transform any of you?" Lampyri gave a deep breath. "Sets cannot transform anyone that The Engineer had previously transformed. Since all three of us bear The Engineer's mark, Granite's powers were completely useless in that situation." "But that doesn't make any sense! I saw The Engineer tell Granite to transform you guys! Why would she do that if she knew that there was nothing Granite could do?" Wingen asked, puzzled. "Because that's just the way The Engineer works," Lampyri answered bitterly. "I don't think she really cared about getting at Flicker. I think she just wanted a show and thought that manipulating Granite would be the best way to achieve that." Before long, the entrance to Obsidian Quarry was in sight. The Marlock carriage stopped, giving Flicker the chance to see the wheel tracks right in front of them. The tracks ended not terribly far outside of the tunnel and led to another Marlock carriage, one that was vacant. Dimitri's intuition was right; Granite had returned to Obsidian Quarry. Flicker and Wingen got out of the carriage. As they began to leave, Dimitri asked, "You sure you guys will be fine on your own?" "Yeah, we can do this," Flicker assured him. Dimitri nodded, understanding Flicker and Wingen's desire to make the confrontation with Granite their fight and their fight alone. He wished them luck, a sentiment that was echoed by Lumin, albeit with much more worry. Lampyri began to sit up just as Flicker and Wingen started to head off. Flicker gave a slight groan, expecting another lecture over how impulsive he was being. Instead, Lampyri said to them, "Granite is still inexperienced with his powers and therefore he isn't able to make the most of them. You two stick close to each other. Alone you have numerous flaws that can easily be taken advantage of. But together you cover each other's weaknesses, and that's something Granite can't boast about himself." Granite had controlled Obsidian Quarry for a long time. He knew how to bring it to its maximum efficiency and saw that work was being done in the mines at nearly all hours. The city was always noisy, always busy. But now it was more silent than it had ever been. He had a feeling about it back in Central Cavern, but now Granite saw for himself that Obsidian Quarry practically emptied itself of Neopets. Granite stood completely alone in front of the entrance to the Mine Headquarters. How many lies had he told? How much information did he steal from competitors? And how many people did he step all over? But none of that mattered, as the end result was power, and held onto it for so long. Now he could feel it slipping away from him, his grip finally weakening. What did I do wrong? Granite stomped his foot, bringing up a cloud of dust. Nothing! The Engineer, Flicker, and those worthless miners! It's their fault! They all defied me! The blame lies with them! The cave was quiet and empty of activity. So much so, that Granite heard footsteps echoing behind him, even though they were from a fair distance away. And then he heard someone take a deep breath. He turned around, even though he had a good idea who was behind him. Flicker and Wingen. There was too much distance between them for either side to launch an immediate attack. But with how quiet the city was, Granite hardly needed to raise his voice to speak with the two Neopets. He said to Flicker, "You're a prince? You –of all people- are royalty?!" Granite started laughing. "A scrawny, feeble king and a thick-headed prince rule a kingdom of conceited fools! How fitting!" Flicker's eyes narrowed at Granite's insults. Granite hissed in response, "Do you think I'm scared of you, Flicker? Do you think I'm going to get down on my knees just because you were born in a palace? You were under my command for three years! Calling yourself a prince doesn't change a bit of that!" Wingen started to open his mouth to defend Flicker. But then Flicker's hand outstretched in front of the Wocky, stopping him from saying anything. Flicker stared Granite straight in the eyes. "No it doesn't. I don't care if I'm a prince! And I don't care who you are either!" In the past, Flicker would always follow Granite's orders without a single word. Granite so very rarely heard Flicker speak at all in his presence –let alone directly at him- that he hardly knew what his voice sounded like. And now Granite was starting to lean back in shock at the fact that Flicker was speaking so defiantly at him. Flicker grit his teeth as he held his hammer out. "I'm sick of you treating everyone like dirt! And I'm not letting you get away this time!"